The Overland Storage V3 VDI server platform is a turn-key, purpose built and custom tuned appliance that delivers on the industry’s original promise of high performance virtual desktop infrastructure. Each V3 appliance ships ready to drop into an existing VMware environment and begin serving up workloads in an hour or less. Overland Storage offers a range of appliances with densities ranging from 100 to 200 virtual Windows desktops per appliance to exactly fit your organization’s needs. Employees will love working on virtual desktops guaranteed to run two to eight times faster than physical desktops. System Administrators will love how easy it is to scale capacity, reduce management costs, and eliminate performance bottlenecks. A V3 deployment empowers IT professionals to offer end users the flexible work-styles they demand while at the same time managing the wide range of devices and cloud technologies required to support today’s on-demand world. It’s all part of the no compromise, next generation VDI solution from Overland Storage. V3 VDI appliances dramatically simplify, streamline and cost-reduce infrastructure administration while improving the quality of user experience and shortening data access time. The V3 Appliance is a hyper-converged turn-key infrastructure that integrates compute, storage, network interface, hypervisor infrastructure, and powerful management software. V3 technology eliminates the performance bottlenecks, installation problems and unpredictable scalability of traditional Virtual Desktop Infrastructure (VDI) deployments. The benefits and cost savings are dramatic compared with both physical desktops and traditional, multivendor VDI. Users experience both superior performance and increased productivity. Total cost of ownership is significantly lower including acquisition, maintenance, administration, power consumption and cooling. The Complete Solution Available Now from Overland Storage. Overland delivers the complete turn-key solution including V3 VDI appliances, VMware licenses, SnapServer Network Attached Storage (NAS), and SnapServer Scale-out NAS. Overland and its partners also provide pre and post-sale services including architecting, pre-sales engineering, installation, training, consulting and customization. Traditional VDI are often complex, expensive, and risky. V3 appliances solve these problems and deliver virtual desktop success quicker, faster and more scalably. Lengthy, complex, expensive, disruptive, and unpredictable installation with multiple vendors, systems, and infrastructures V3 solutions are standalone appliances with onboard compute, storage, licensing, and management. Arrive pre-provisioned to enable installation in hours, not days. Poor performance & user experience V3 appliances eliminate latency by locating compute, storage, and management on the same bus in the same chassis. Vulnerability to outages Local pools, local storage, and local replication deliver maximum uptime and business continuity instead of reliance on WAN availability. Superior Manageability with V3 Desktop Cloud Orchestrator (DCO). DCO is a comprehensive management solution that supports pool creation, pool migration and policy-based administration for failover, backup, and reporting. DCO delivers simplification thereby eliminating arduous, expensive training required by industry-standard hypervisor administration tools. DCO is bundled into the cost of a V3 appliance and it includes everything a desktop administrator needs to manage desktops in a single, secure, centralized console. V3 appliances help reduce security vulnerabilities because data is never transferred to or from desktops. Administrator-controlled access is available in real-time. Compared to a physical desktop that can be lost or stolen, V3 VDI-based data remains in the data center instead of on a vulnerable endpoint device. V3 appliance enable guaranteeing users experience 2 to 8 times faster performance compared to an average local desktop PC. V3 appliances deliver the fastest desktop cloud infrastructure in the industry for any desktop type, large image or small, persistent or non-persistent. 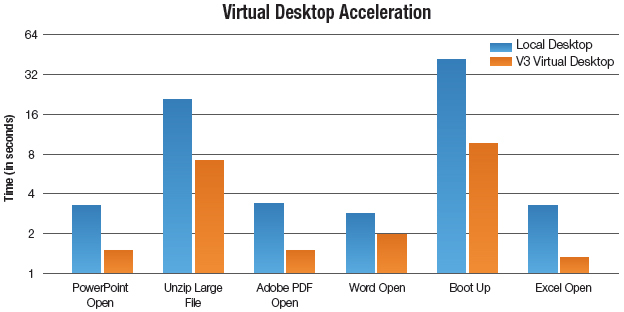 V3 customers enjoy a virtual desktop as their primary desktop because performance is so high. V3 hosted virtual desktops can run any application, large or small, and give end users the freedom to have their very own custom virtual desktop. V3 appliances enable user applications to run at unprecedented speeds, resulting in simplified IT management and greatly increased end-user productivity and satisfaction. Overland Storage with its V3 appliance simplifies desktop virtualization with innovative technology that makes it possible to achieve virtual desktop performance that is 200%-800% faster than physical desktops, hosted from a single 2U server appliance. This means that companies will save money and time using V3′s drop-in appliance due to the fact that it is pre-optimized to guarantee performance, utilization, and availability. The high-density V3 appliance supports 100 – 200 virtual desktops with minimal IT support; it is platform agnostic and integrates with virtually any existing or new infrastructure. Traditional VDI management is performed by a combination of SAN, networking, and core infrastructure administrators. This approach is unnecessarily complicated and expensive because of the large number of people involved. Moreover, it leaves desktop administrators completely out of the equation. V3’s simplified architecture returns control back to desktop administrators who can now manage thousands of desktops, from either centralized or decentralized locations. Each appliance is compatible with V3 Desktop Cloud Orchestrator™ (V3 DCO) which provides a simple user-friendly interface for managing dedicated virtual desktop pools. It also provides enhanced functionality such as failover and restore via V3’s Optimized Desktop Allocation™ (V3 ODA). 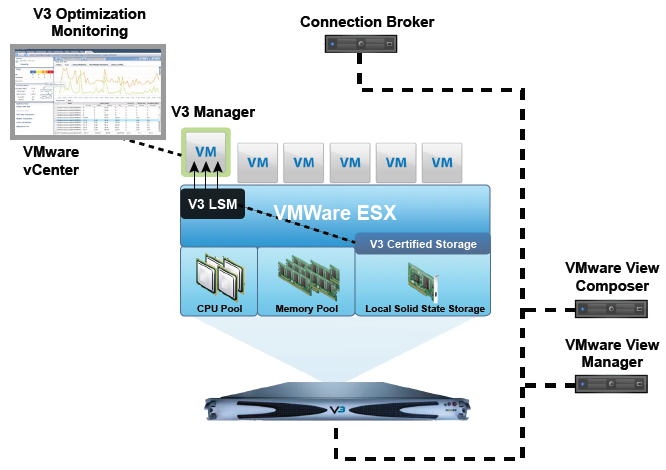 V3 DCO communicates with VMware View and vCenter to enable management of your dedicated virtual desktop pools. Your cost benefits are derived from the way V3 implements storage, server and networking resources.. By replacing high-density disk arrays with more cost-efficient V3 appliances, operational costs are lowered. V3’s exceptional appliance density results in lower sprawl, reduced energy consumption and cooling costs; more efficient machines result in lower total cost of ownership without sacrificing performance, availability or utilization. And depending on the type of desktops you are replacing, V3 appliances provide maximum savings compared with higher-cost physical PCs. Legacy Desktop Virtualization has been around for many years and have provided benefits that include centralized management, lower operating expenses, increased security, computing availability, and efficient application deployment. However, fast performance and scalability have been conspicuously absent from that list. Today, the V3 appliance architecture makes it possible to add measurable performance improvements and high scalability to the value proposition of virtual desktops. V3 appliances deliver the fastest desktop cloud infrastructure in the industry today. V3 appliances use PCIe-based solid state as V3-certified storage. This provides faster access time for working data, and lower context switching, which minimizes unnecessary CPU usage when switching between applications to overcome the problems of slow performance and poor end user experience associated with VDI. By keeping working memory (OS and Temp files) closer to the CPU, access latency is reduced by an order of magnitude while providing optimal use of local storage. This architecture only leverages expensive shared storage (SANs and NAS) for persistent (user) data. So what does V3 mean to its Customers? V3 Guaranteed Performance: Every V3 appliance is guaranteed to outperform high-performance physical desktops. V3 Guaranteed Utilization: Every V3 appliance is guaranteed to maintain superior performance, even at full capacity with heavy workload users. V3 Guaranteed Availability: Every V3 appliance is delivered with V3's Management & Optimized Desktop Allocation ("ODA") Tools, which enable Customers to migrate and access their persistent or non-persistent desktops in the Cloud, either locally or remotely, without sacrificing performance. Dramatic TCO Savings: Dramatic TCO savings are derived from the way the V3 Appliance is implemented and deployed. Replacing high-density disk arrays with more cost-efficient V3 Appliances lowers energy and operational costs as well as capital or "cost per seat" expenditures. Legacy virtual desktop management is performed by a combination of SAN, networking, and core infrastructure administrators, which is complicated and expensive because of the large numbers of people involved. It leaves desktop administrators completely out of the equation. V3's simplified architecture returns control back to desktop administrators who can scale management to encompass thousands of desktops, from either centralized or decentralized locations. Because V3 Appliance density and performance are so high, deployments result in lower sprawl with efficient machines that "drop in" to scale from 100's, to 1000's even 10's of thousands without compromising V3's Performance Guarantees. 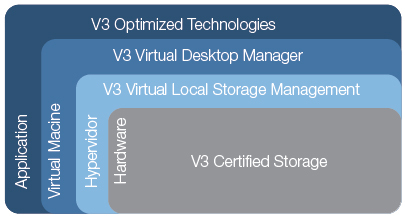 V3's Optimized Technology stack includes V3 Certified Storage™, the V3 Local Storage Management (LSM) Framework™, and the Local V3 Manager™. V3 Certified Storage utilizes best-of-breed Solid State technology, which is configured optimally using best practices for local storage in V3 Appliances. The V3 LSM leverages best practices to bridge optimized two-way communications between Certified Storage and Appliance managers both local and remote. The V3 Manager monitors, manages, and optimizes the Certified Storage for optimal configuration and reporting. Health and Performance are reported and delivered either to V3's Local Management interface, or to VMware's vCenter™ via a plugin. Figure 4 has an annual operating cost of under $4,000. In contrast, legacy VDI annual costs exceed $4,500 and physical desktop annual costs exceed $5,000. Figure 5 shows that the cost to deploy a V3 appliance is significantly better than legacy VDI and far, far superior too a do-it-yourself VDI solution. 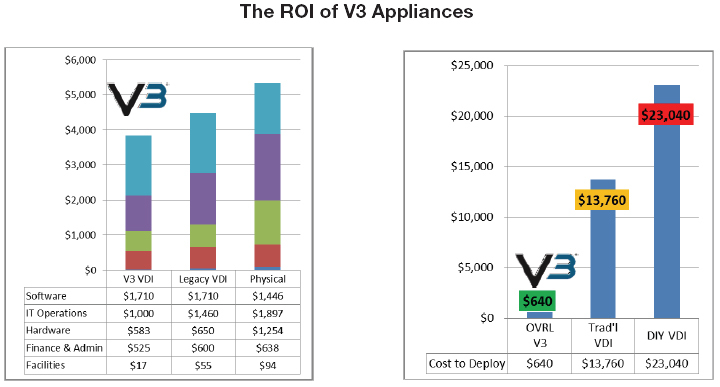 Figure 4 and Figure 5 demonstrate that V3 appliances have a significant annual savings per desktop compared with legacy VDI and physical desktop devices. V3 is the future of server hosted virtual desktops. Download the V3 Appliances Datasheet (PDF).